Cat’s Pawn and Cat’s Gambit – book reviews by Fred Patten. Cat’s Pawn, by Leslie Gadallah. NYC, Ballantine Books/del Rey, March 1987, paperback 0-345-33742-5 $2.95 (262 pages). Cat’s Gambit, by Leslie Gadallah. NYC, Ballantine Books/del Rey, March 1990, paperback 0-345-36478-3, $3.95 (247 pages). Despite being action-packed, this duo of space operas is unusually pessimistic, even despondent. Cat’s Pawn begins with a framing story set on Terra centered on Talan, the Oriani ambassador to Terra, glumly failing in his mission to win support from the Terrans in their struggle against the interstellar spreading Kazi. Symptomatic of the problem is that the Oriani do not wear clothes and look like large, bipedal housecats; and what Terran can take a funny-animal cat seriously? … and gets Talan reminiscing about his youth when he knew Bill Anderson. This is the story in Cat’s Pawn from page 24 on. Bill Anderson, 31 years old, is a fresh Civil Service translator assigned to the Terran mission on the Centauri colony. A massive heart attack en route on the hyperspace ship, where he meets Talan, strands him on the backwater planet Orion, where the continuing need for Oriani medical help means that he is marooned on that world. Anderson is faced with having to establish a new life for himself on mostly desert Orion. The city in which he is, Owr-Lakh, is completely inhuman. For one thing, the furry Oriani do not wear clothes and cannot understand why he is reluctant to go about naked, or to give up shaving. Anderson finds Orion’s Space Central spaceport more congenial. There the myriad spacegoing creatures with their myriad customs can understand his desire for clothing, and use his ability with linguistics to hire his services. “The Kazi climbed Steven’s desk and ensconced itself on the top, crouching on its many legs to bring itself eyeball to black, faceted eyeball with the human. This posture was meaningless to it, but it had learned that this person paid more attention when it was face to face with its audience. It had a hideously ugly, rigid, blank face. Steven suppressed a shudder. “If he had met it [a Beta Ellgarthan] on the street, Anderson would have thought it a meter-high pile of straw. He couldn’t even figure out what part of the thing to talk to. Anderson resents becoming a pawn for either Black or the Oriani, and the Oriani are desperate to find allies to help them stop the Kazi expansion. The main feeling that the reader gets in Cat’s Pawn is Anderson’s and Talan’s frustration. The Oriani, without allies, have been exterminated except for the few refugees who managed to escape from Orion before its fall, and they are growing old and dying off in exile. The Terrans, and the Llevici who are only incidental characters in Cat’s Pawn, have surrendered to avoid a space war that they would surely lose, and have become no more than spacegoing colonial natives under Kazi overlords. Cat’s Gambit is set around the feeble, disorganized resistance movement that some of the conquered are trying to set up. The three protagonists are Ayyah, an Oriani who is Talan’s daughter and self-appointed spokeswoman for the hidden Oriani survivors; MacDonald, a human ex-Fleet officer and current space pirate; and Delladar Oll, a Llevici renegade who is sent offworld to get weapons for her mountain clan still holding out against the Kazi. They are introduced separately, and almost accidentally come together; at first suspiciously, only gradually realizing that they have to learn to trust each other and unite – if it is not already too late. 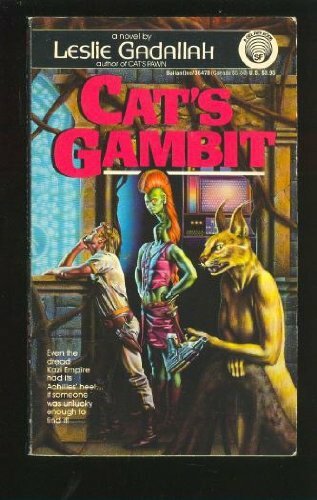 Cat’s Pawn and Cat’s Gambit are excellent examples of space opera in the Star Wars tradition. They seldom have a dull moment, with characters scheming against and trying to kill each other. More important for furry fans, both are full of colorful aliens. 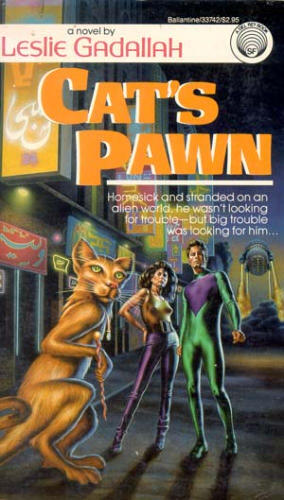 Barclay Shaw’s cover for Cat’s Gambit (he did the cover for Cat’s Pawn as well) shows the human MacDonald, the Lleveci Delladar Oll, and the Oriani Ayyah. The latter two are more than humans in superficial alien costumes; Gadallah gives them inhuman physiology and instincts as well. The Kazi are also fleshed out, becoming more than faceless menaces. Cat’s Gambit brings the duo to a satisfactory conclusion, although furry readers may be disappointed that the catlike Oriani do not appear again elsewhere. The two novels have been out of print for several years, but Gadallah announced in 2012 that they would be republished in revised editions with new titles by the Canadian Five Rivers Publishing, sometime during 2013. 2015 P.S. : Cat’s Pawn and Cat’s Gambit have not shown up yet in Five Rivers Pubishing’s catalogue under any titles.